"Real generosity toward the future lies in giving all to the present." I love this quote and would love to hear how each of you "give all to the present." 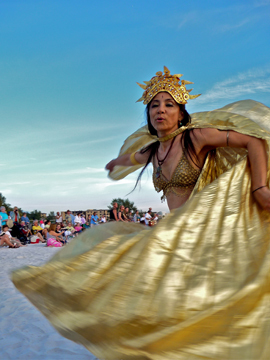 About the image: Woman dancing on the beach, Sarasota, Fl. Giving all to the present. This moment is a gift. I cherish it. Experience it. Express it and release it, in love. I know I do not "give all". I have not reached that level of consciousness yet. I'm aware of the moments I have, and of the moments I've lost when the lizard brain has been engaged. I hold close the moments I've experienced as fully as possible.